Our company has gained expertise in offering Wedding Event Catering Service. Empowered with the aid of our killed professionals, we are the leading wedding service provider. 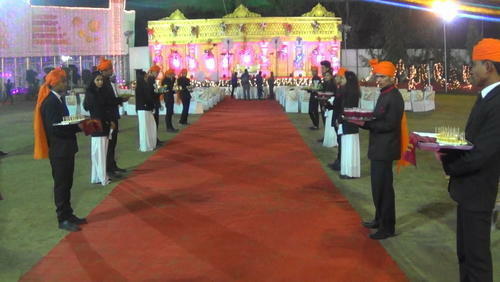 Our team of experts arranges full management of wedding with decoration and also organize small events. Prior to render this catering service, we work in accordance with our clients to understand their requirements. Our offered catering service is widely admired by our clients for their timely execution. Established in the year 1986 at Jaipur (Rajasthan, India), we “Mathurawala Caterers” are a Sole Proprietorship and Division is managed by a qualified & experienced people engaged in the business of luscious food processing and food preparation business. It caters many items comprising of North Indian, Chinese, Mexican, Rajasthani & Gujarati dishes, Chaat, Sweets, Desserts, Soups, Fruit Juices, Shakes etc. All these food items are prepared as per our own conventional customs and procedures.